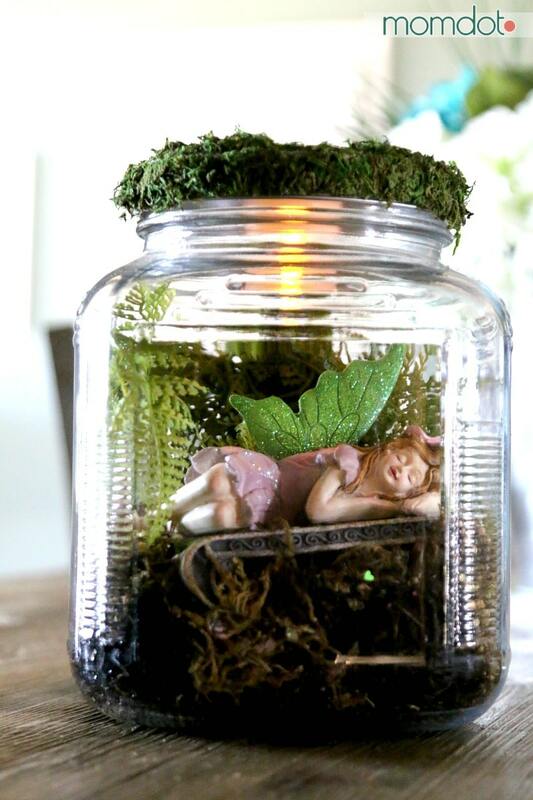 I love working with mason jars and I was able to with my DIY fairy House tutorial. I love mason jar crafts. After all, I am a southern gal and southern gals have about 989 jars, including every jam, jelly, and mayo jar every made. Tossing those things in a recycling bin is a class C felony. I might have some emergency hurricane or something that requires filling them up or some sort of canning job where I need a lot of jars- even though I have never ever canned before. It may happen. In any case, with jars, jars, and more jars, I have been trying my best to come up with some constructive fun for all my mason jars this summer so I can stop looking like a hoarder. Today I wanted to bring you a super fun thing I did with my jars last week. Ok, two super fun things, but just one in this post. I have been seeing all these adorable and sweet fairy gardens. From broken up plant holders to full on buckets filled with itty bitty tiny houses and lights, they just fill me up with “THAT IS SO CUTE!” expressions. And I wanted one. But not one that requires purchasing $395 pieces of dollhouse furniture. That involves a jar I have laying around. I think what we managed to create over here is darling and bonus, looks epically cute on my desk. Plus, I think it could open up an entire world of mason jar fairy homes and scenes in my house. Which is kinda exciting. So here we go mason jar lovers. Grab your hot glue, jar, dirt and let’s get going. Big Jar – like super big. One you can stick your hand into. I got this one at Hobby Lobby for $13 and if you get one of those online coupons, you can get it 40% off. 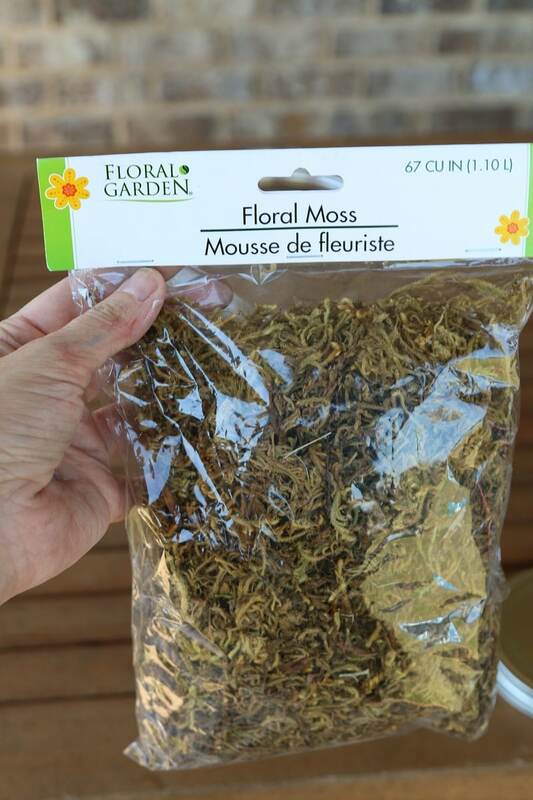 First, layer your mulch and then your moss. I used these two simply because I liked the patterns of colors in the jar. I just filled them up about 1/3rd of the way so I had a nice base. 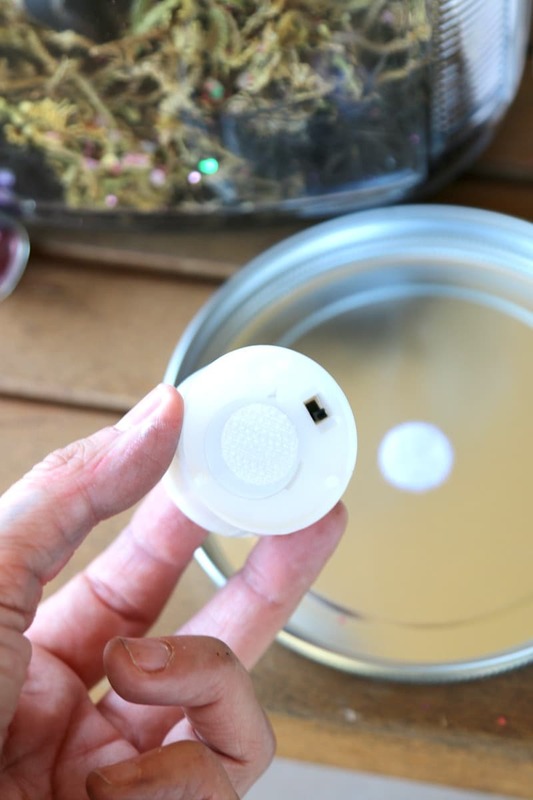 Becuase I wanted my mason jar to have some light, so it could be used as a nightlight or outdoor fairy jar, I took a battery powered tea light that had an on and off switch and Velcro one piece on the bottom of the lid and one piece on the tealight. This makes it simple to take on and off and turn the light on and off as needed. You can get these little velcros in the sewing section and they have a little peel sticker, so no hot glue required. 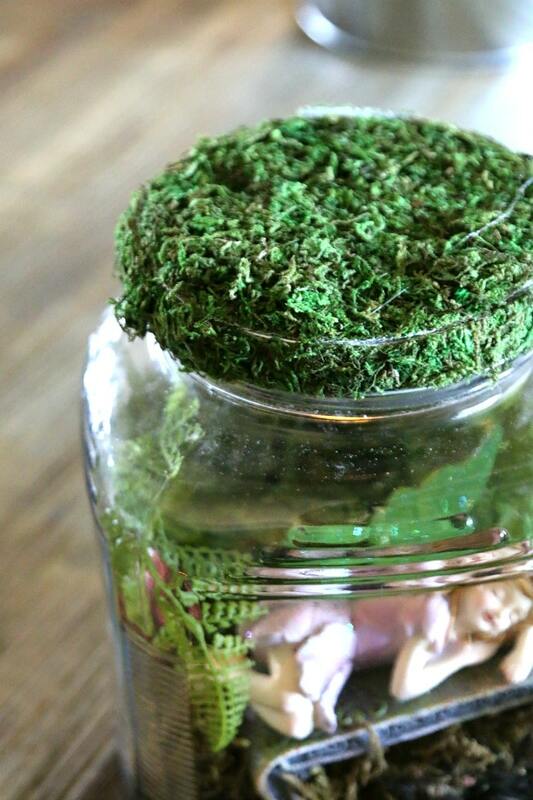 3) For the lid, I used a moss sheet. They come folded up and quite large so it’s easy to cut out and glue the exact amount you need for the jar lid. You don’t have to do this, but I felt like it made it more organic and adorable. 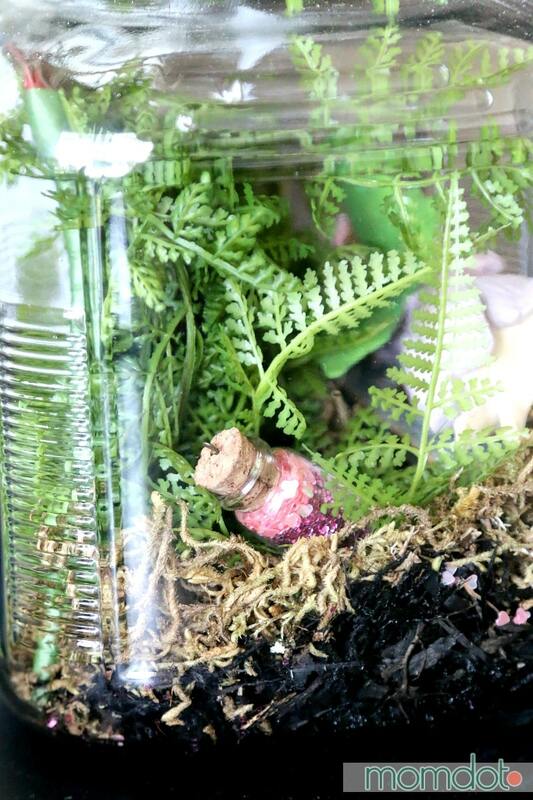 4) Its hard to tell in this shot, but I also added a piece of plastic green grass inside and in the back of her to create more of a forest look and fill up the jar. 5) Once the jar was set and my fairy was in place, I sprinkled some heart glitter. 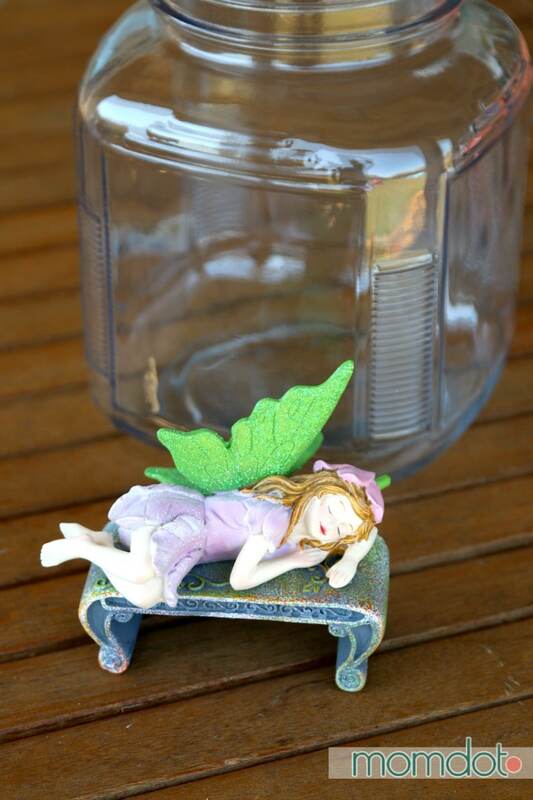 Because fairies sleep with heart glitter. Duh. All done! 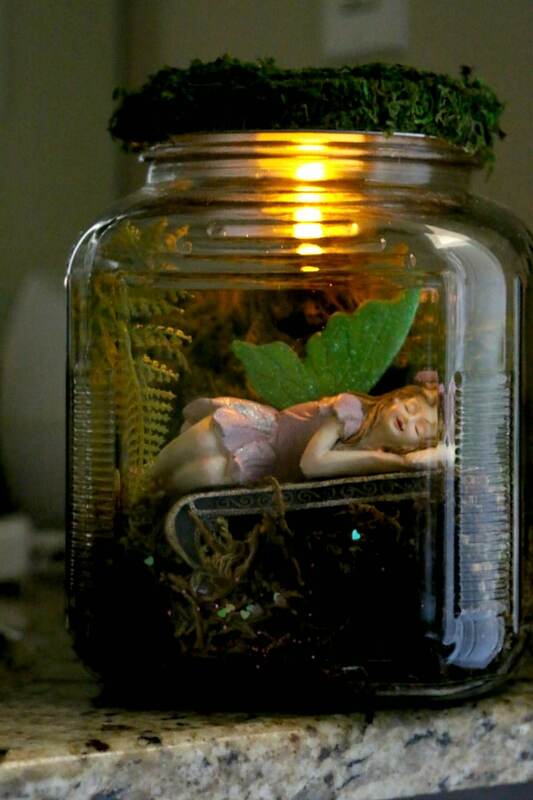 She looks adorable as a night light, outside in the garden, or just on the desk. Light optional! « Samsung Family Hub Fridge Review: WOW!